i-D Online recently had the rare opportunity to sit down with Japanese designer SK8THING, whilst he spent some time in London. The interview sees i-D learn a little more about the designer’s new brand C.E. 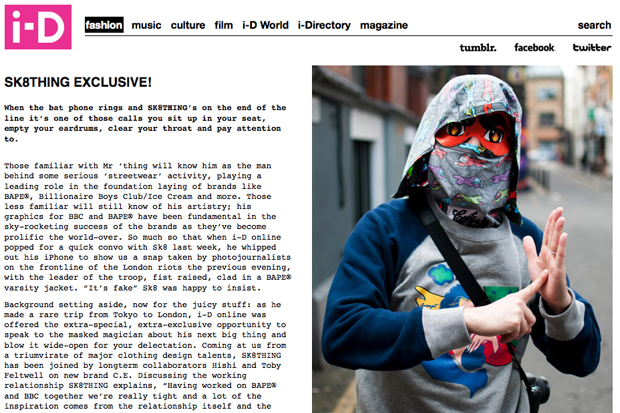 (Cav Empt), and discuss his history with BAPE and BBC/Ice Cream amongst other things. The masked artist teams up with long-time friends Hishi and Toby Feltwell on his new project, which will see the trio ditch the much abused ‘heritage’ trend in favour of something much more futuristic. Little info about C.E. has yet to leak, so this is the first real hint at what’s to come. Read the full thing at i-D Online and look out for more on the brand soon.